The last few weeks were a blast. The workouts were fun and challenging making this years Open memorable. We used a new piece of equipment (dumbbells) and a new movement (burpee box jump overs). I set out to achieve a goal this Open and unfortunately, I didn’t reach it. After a few days of self reflection, I’m more motivated to workout this year.My goal for this Open was to place in the 30’s on Guam. Last year, I finished the Open in the 46th spot but this year I placed in the 51st spot. I’ve come up with two reasons why I placed a lot lower this year and didn’t reach my goal. Sorry J.J, I’m a few months behind on rent. 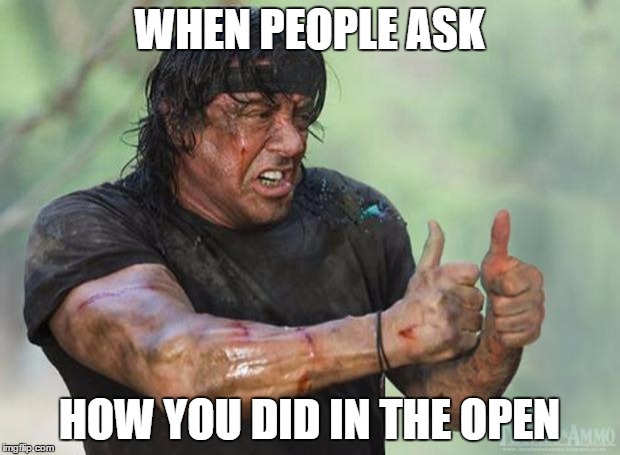 This sentiment sums up my year since the 2016 Open. Early last year I focused on Oly programming and stopped doing metcons. The Oly programming was long and heavy on most days leaving me with no energy to do a class WOD. I also got married and did not workout or eat healthy for about two months. It adds up. My lack of conditioning showed in 17.4 with me finishing short of my score from last year. I did not put in the work this year. I hit PR’s on workouts and increased my fitness but it wasn’t enough. The guys I used to beat in workouts are now beating me. This past year, the guys put in the work. It was a lot more than me and it showed in the workouts and the leaderboard. I did not put in the work this year so I’m not surprised I didn’t hit my goal. I’m now more motivated. I want to at least make it into the 30’s on the leaderboard next year. I want to work on Oly lifts but I also want to work on conditioning. It’s going to be a balance but I’m sure I’ll manage. I also want to work on my gymnastics skills, especially muscle ups. It’s going to take a lot of hard work and I’m looking forward to it.